At its core, gamification is the process of taking game mechanics and applying them to non-gamified situations. Due to its proven positive effect on employees’ engagement and motivation, gamification has become a popular initiative that has been introduced in offices around the world. Due to its simplicity, gamification is really easy to implement in your office. However, it can also go wrong if mistakes are made. That’s where this blog post comes in - we have gathered the top ten gamification mistakes in order to help you introduce a gamification initiative seamlessly into your business. Keep reading to find out what they are! The ultimate aim of a gamification incentive is to get your employees to achieve high results. However, a fatal flaw of a gamification solution is when rewards become more important than results. The risk you face when rewards overtake results is that if for some reason you decide to stop using gamification, motivation and engagement will hit an all-time low as your team has long forgotten about meeting their targets as they've been so concentrated on winning prizes instead. One way to avoid this happening is to make sure you always begin with your objectives and then mould your gamification solution around these objectives, not the other way round. You need to set clear objectives of what is expected from your team. Establish clear desires about what you are hoping to achieve through gamification and what your expectations are of staff and their attitude towards the program. Aside from setting clear objectives for your team, you also need to consider what behaviours you are hoping to encourage through gamification. Research body Gartner predicted back in 2012 that 80% of gamification applications will fail by 2014. The number one element they attributed this failure to? Poor design. Gartner’s Research Vice President warned in particular about the dangers of “slapping meaningless badges on activities and creating gamified applications that are simply not engaging for the target audience". The target audience, in this case, is your employees, so consider what changes you want to see, set appropriate objectives and base your gamification tactics off of this. It is important for team morale that you don’t allow your friendly competition to turn sour. Gamification should never cause resentment among staff members. One way to avoid this is to reward your team as well as rewarding individuals. Tell your team at the beginning of the initiative that if they hit their KPIs, they will all earn a reward. This will encourage team collaboration and get them working together to achieve their goals. To get your team excited about gamification, you need to make it visually appealing. This could be through a leaderboard, a dashboard, or some other visual mechanism for displaying as-it-happens results. Making performance clear and open in this way makes it easier for the team to understand how they're performing instantly, which gets them excited and engaged. Plecto gives you the ability to use game mechanics in your office, thanks to our gamification features. Create leaderboards, give badges and set up contests to help drive engagement and performance. 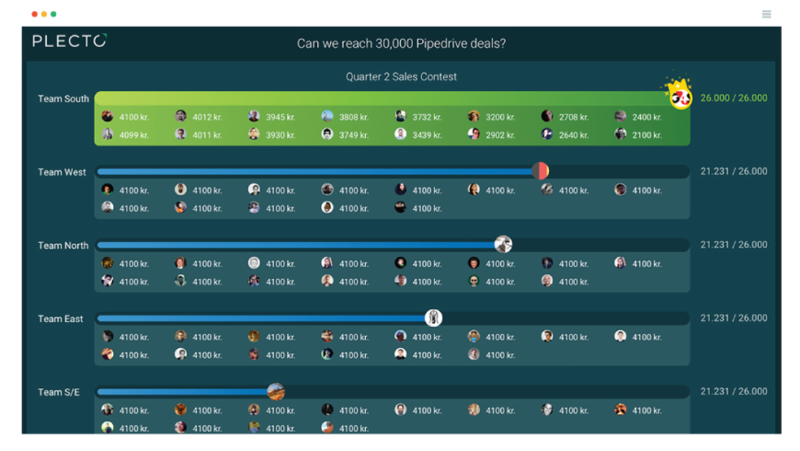 A Plecto dashboard showing an example sales contest. When first exploring the world of gamification, it can be tempting to create an elaborate solution composed of different levels, badges and dimensions. In order to maintain the interest of your staff and make your life easier, we strongly suggest resisting this temptation! Gamification doesn’t need to be complicated in order for it to work, in fact, gamification experts have advocated for the simplicity of gamification. For gamification to work, your reward process needs to be effective, as this is what keeps your employees engaged and motivated. Ask your employees what kinds of rewards they would like to have; you might think they all would want a pay rise but some of their answers may surprise you. It is better to get their opinion before implementing a reward structure, rather than finding out later that your rewards are not exciting and inspiring them. Doing some research on other companies’ gamification programs is valuable, especially if you’re unsure how to begin implementing gamification in your company. Find a company of a similar size or industry as you using gamification and take notes about what kind of rewards they have in place, and what behaviour they reward. Learn from the mistakes of other companies to avoid falling victim to these same mistakes yourself. Having their hard work recognised is one of the key reasons why employees are keen to get onboard with a gamification initiative. However, employees will also appreciate if their rewards increase relative to their achievement. If your salesperson closes a huge deal, then they should receive a larger reward. Otherwise, your sales team will begin to learn that they can earn the same rewards by doing the bare minimum, which is not what gamification should encourage. Aside from not rewarding your employees enough, there is also danger in rewarding your employees too much. If your reward structure becomes unsustainable and you suddenly decrease the number of rewards you give, this will seriously damage trust and morale among your team. It is better to start small and establish what works for your team and company rather than rewarding too often and too soon. Employees would much prefer for the number of rewards to increase as time goes on, rather than the opposite. Rewarding too often also removes the excitement of rewards as the novelty wears off quickly. Gamification experts advocate for keeping your reward process random and exciting. This could be by spinning a ‘wheel of fortune’ everytime a reward is due, with the prizes up for grabs ranging from a bottle of wine to something more extravagant (of course this depends on how much budget your company has). This randomness keeps the reward process exciting and unexpected. If your employees know they are going to get the same prize every time, they may get bored and the novelty of the gamification initiative will wear off quickly. Interested in implementing gamification in your business? Sign up for a 14-day free trial of Plecto by entering your email address below and begin experimenting with our gamification features now.